When you're special holiday such as Thanksgiving or special event needs elegant cutlery that you don't need to clean, then the Modern Design Silver Plastic Cutlery gives you all that and more. 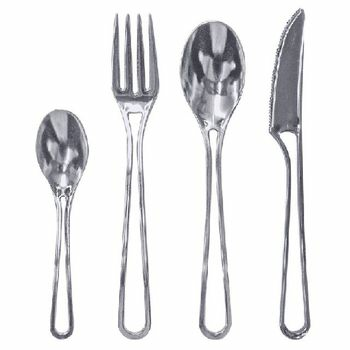 Plastic silverware is all the rage because they provide the elegant look of real silver, but without the cleanup. Once your event is over, the last thing anyone wants to do is clean up and wash dishes. With these silver cutlery, you won't have to worry and they look great. Modern Design Plastic Silver Forks 20ct. Modern Design Plastic Silver Knives 20ct. Modern Design Plastic Silver Teaspoons 20ct. Modern Design Plastic Silver Soup Spoons 20ct.